VZW LG G2 now fills up, can't get free memory. I've deleted all my music, most photos, uninstalled about 6 apps, and cleared cache in many others. I've had this phone since November. 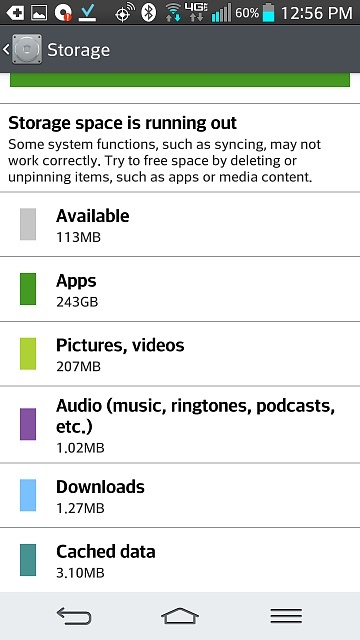 Up until about 3 weeks ago I never used more than about 17 Gb or so, and had loads of music, photos, and apps. Now, even with everything I can think of removed or uninstalled it shows as virtually full most of the time. Sometimes it tells me I can't get more email or texts as memory is full. It shows just 100-200 Mb free out of the 32 Gb. How do you tell it to "clear stuff already deleted" or whatever? Can it be defragmented? I scanned with free version of Avast! many times - no problems. I just uninstalled Avast! hoping to make more room. No luck. Any ideas? FYI - I'm new to Android and don't know how to root and such. THANKS. Welcome to Android Central! Could you post some screenshots of your Settings>Storage menu? It would help to see that breakdown. In the meantime, try using an app that can list and sort your files in order of size, to see if there's some huge leftover file or files that are taking up space. You could try Storage Analyser. Also, consider deleting all of your texting threads, especially if they include photos or videos--that can take up a decent amount of space (although typically not in the multi-GB figures). Wow - thanks for your rapid help! A requested screen shot is attached. If I click "Apps" within "Storage" there seem to be too many pages of apps to easily screen shot. I used "File Manager", listed "All Files" in "Internal storage", and sorted by size. It seems to say the largest files I have are in the "Preload" folder and are the 2 factory original videos called "Norway_FHD.dm" (142MB) and Europe_by_Dominic_FHD.dm (106MB). I could delete them but I kind of like having them to show. After that is folder "Android/data" which has a few dozen sub-folders, most of which are empty or have a few small files, though I haven't opened every single one. The third listed folder is "Download" which has 3 small PDF files, all less than 1 MB. After that is "Music", which has all my empty music subfolders. Oh - I did delete virtually all texts, and reduced the memory that my email accounts use. Is there some process that needs to run to "actually free up" all the space I've already made available? THANKS AGAIN! The G2 has 32 Gig of storage before taking off the room the OS and bloat take. Your screenshot says you have 243 GB of Aps. Something is not right. plug the phone into a computer and delete any folders left over from uninstalled apps. are u using the stock ROM? do u have xposed installed? any other heavy customizations? I saw that too. WAIT. I just saw that "NYTimes" is listed as a 241GB app! That can't be right. I just uninstalled it - PROBLEM SOLVED!! THANKS TO YOU BOTH!! That is messed up. Glad it works now! Thanks! Everything is stock - I don't know how to do custom stuff. Would a "factory reset" clear my data and apps??? At any rate I just found the problem. The NYTimes app was 241 GB. I uninstalled it and now the phone is practically empty. HURRAY! A factory data reset would remove all data, songs, pictures, and anything else you added to the phone. It would reset the phone to how it was when you first bought it. And I just checked...the NY Times app is supposed to be less than a 6 MB download according to Google Play. Strange it showed up as 241 GB on your phone. It was clearly some kind of glitch. Not sure when we'll have 256 GB phones, but I hope it's soon! Fan of teleglitch? Try this [FREE] game on for size!